How invested are you in your child’s eating? Are you so invested in getting them to eat that you find yourself bribing them to eat certain foods? Are you using these special foods to get them to eat? If you answered yes, I’d recommend you read on because I want you to know why it doesn’t work in teaching your child to be an intuitive eater and to let you know there is a different way. Parent: You need to eat more chicken. Parent: Do you want ice cream? Child: Starts crying and says they don’t want more chicken. Have you ever had a conversation or one like it with your child? In my experience this type of conversation rarely results in your child eating more of the said chicken or food. At this point it gets into a battle of the wills and typically your child always wins, because in reality there are 3 things you can’t force a child to do…eat, poop and sleep. Let’s start with a little bit about development. Your child is looking to be their own person separate from you. One of the ways children learn autonomy is around eating. 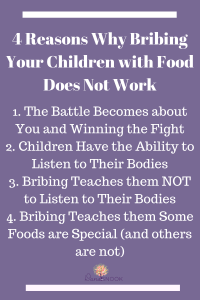 Children enjoy having control of what to eat, however, when they feel like it is a battle they will dig their heels in and refuse to eat whatever it is YOU are TRYING to get them to eat. So even though you are attempting to bribe them with something they really do enjoy eating; it typically doesn’t work because they are working too hard to win the fight. Children really do have in innate ability to listen to their bodies and eat exactly what their bodies need. Yes, it’s true it doesn’t always happen and they can learn to disconnect from their bodies if they are constantly being told not to listen to their bodies. For example, let’s just say your child has already met their protein needs by dinner. They may reject eating chicken – not because they don’t like it, but rather because they don’t need it right now. However, they may still have not met their carbohydrate or fat needs and may be craving those foods on the table. No matter how you try to sell it to them, they aren’t going to eat the chicken unless that is what they really want and need… and you don’t want them too – you want them to listen to their bodies. The reality is you are typically bribing your children with foods that taste really yummy! Children love foods that taste really yummy. Bribing them with these yummy foods can interfere with them eating what their bodies need. For example, let’s just say your child only eats a small amount for dinner because they have listened to their body and they are full. You tell them if they want dessert they have to eat two more bites, but they are full. However, they really want that dessert because it’s yummy. Either they still refuse or if they want it bad enough they squeeze in those two more bites to get dessert. In attempt to get them to eat more they are also learning to disconnect from their hunger and fullness cues, eat past fullness to “get” dessert. Essentially it can be looked at as being taught to overeat. This interferes with them learning to listen to their bodies. In the above scenario the parent was attempting the child to eat more chicken to earn ice cream. However, how the child hears this as, “That chicken must be so bad that I get ice cream if I eat it.” So when you try to bribe or reward with food, you are saying this food is so much better that you have to do this horrible thing to get this good tasting food. It will also glorify the other f ood as well – it teaches children that ice cream is better than chicken. The next time they eat that chicken they will think more negatively about the chicken thinking it is so bad they aren’t going to like it. In reality though, it probably just meant they didn’t want to eat it at that one time. I can honestly say since I do this for a living I remember I have always made the promise to myself that I would not bribe or reward for food. However, I’m human too. A few years ago I was getting family pictures done. Let’s just say my daughter was not cooperating and for the first time ever I said, “If you smile for these pictures I’ll get you M&Ms.” I actually can roll my eyes at my attempt at this because first of all since M&Ms are no big deal in our house, she didn’t know they were worth smiling for and second just like I explained above, it really had nothing to do with needing to be bribed – it really had to do with my own agenda around getting these pictures done. 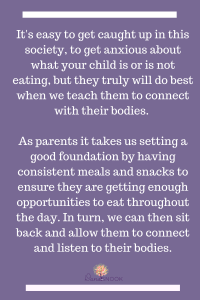 It’s easy to get caught up in this society, to get anxious about what your child is or is not eating, but they truly will do best when we teach them to connect with their bodies. As parents it takes us setting a good foundation by having consistent meals and snacks to ensure they are getting enough opportunities to eat throughout the day. In turn, we can then sit back and allow them to connect and listen to their bodies.